Here We Go Again . . . More News On Tainted Dog Food. Remember the big pet food recall in 2007? Well this time there is just as many problems and since the FDA has not been able to pinpoint where the problems are coming from, no recall. Keep your pets healthy and please do not feed pet food from China. Here is an article that explains in depth what is going on and gives a list of what foods to avoid. And yes, these products are still on the shelves. Looking For Something To Make Your Dog For Valentines Day? Look No Further. Here are two yummy treat ideas, courtesy of The Honest Kitchen. Have fun in the kitchen and let me know if you come up with any great variations! This recipe uses heart-shaped or other cookie cutters to make pretty treats as a gift for your pet – or his or her boyfriends and girlfriends. Process the liver in a blender or food processor, until completely pureed. Beat the eggs in a bowl and pour in the oil. Mix in the dry ingredients slowly, stirring continuously so they are thoroughly combined. Add water gradually, until you have a ‘batter’ consistency. Pour this batter into a flat 1 ½ to 2” cake tin. Bake at 350°F for 50 minutes. Cool in the tin until able to be handled, then gently turn the ‘cake’ out onto a rack and refrigerate* to cool completely. Use heart-shaped cookie cutters** to gently press out individual shapes. Save the scraps as a healthy topper on their next meal! *The other advantage of cooling this recipe in the refrigerator is that it reduces the risk of thievery by your dog, before you have actually finished making it. This is a frequent occurrence with the dogs in our office. **If you don’t have a cookie cutter, it’s also perfectly fine just to cut the loaf into bite sized squares. Really tiny squares are excellent as training treats because they have a good aroma and can be consumed quickly without filling up your dog’s tummy. Preheat oven to 375°F. Insert the cupcake cases into the muffin pan. Combine the Force, warm water and eggs together in a large mixing bowl. Stir in ¼ cup only, of the whipped cream cheese, reserving ½ cup for the frosting. Next, gradually add the honey. Fold in the pitted cherries. Carefully spoon the mixture into the cupcake cases, half filling each one. Bake in the oven for about 25 minutes, until you can insert a toothpick and it comes out clean. Let cool on a rack for 10 minutes. Top with the remaining cream cheese and if using, slice the strawberries lengthways so the slices resemble hearts, and place one or two slices on each finished cake. These cupcakes will store in the refrigerator for three to four days. Serve them up to your pup and her friends! Find these and other homemade pet food recipes in Made out of Love! Berry Yammy's - Berry Good! Front Porch Pets, the makers of Sam's Yams have done it again. 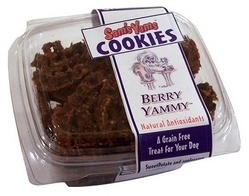 This time it is with Berry Yammy Herbal Cookies. As always Berry Yammy's are made with premium ingredients. They include sweet potato and applesauce, two flavors that we already know that dogs love, and this combination helps "hide" the taste of some of the healthful, but bitter herbs. Next you have berries, herbs and flowers mixed in that contain a full spectrum of colors and flavors. Each 6 oz container about 30 cookies and each cookie has approximately 1/2 teaspoon of botanicals. How is that for a healthy snack? Another Treat That We Love Is Bowser's Best Buffalo Bites. This low fat, nutritious treat is made with natural Buffalo meat. The handy soft moist strips are contained in vacuum packed packaging. No preservatives or hormones and the fact that these are all made in the USA in a USDA inspected meat processing plant are additional reasons to try these treats. Ingredients are: Bison meat, Fortified Textured Soy Protein, Water, Milk, Soy Flour and Seasonings. $6.00 for 10 - 4 3/4" strips that equal 8 ounces. Let's Get Some Buffalo Bites . . .
Durango 95's - 95% Meat and 6 Ingredients That You Can Pronounce. 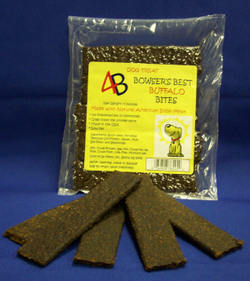 We have found these semi moist treats to be the prefect training treat. 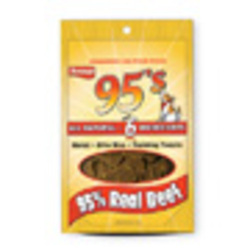 Durango 95's contai n 95% meat (beef, chicken or lamb), chicory, lecithin, sea salts, natural antioxidents and garlic. These treats are easy to break into small pieces. And best of all Durango 95's are made in the USA with all USA ingredients. Each 4 oz resealable pouch is $4.99. Shop Durango 95's.